Why worry about managing your image tags? The greatest strength of image tags is their greatest weakness as well. The greatest strength of tags is that they are free form, meaning that you can assign any keywords to any of your images. Whatever words come to mind when you look at an image, well…that’s what you can assign to your images. This easiness of creating keywords will start becoming a problem when you can’t remember what keywords you have assigned to images that contain similar elements. Let’s take a simple example. You take your kids to the park on two different occasions, let’s say a month apart. The first time you go to the park you take a few pictures and you come home and have a great time looking at them and you assign some keywords: park, playground, swing, maria, stacey, smiles, sings, morning, dress. Great! The following month you take the same kids to the same park and take some pictures. You come home and you start adding some keywords: park, playground, swinging, maria, stacey, smiling, singing, morning, dresses. This is all good, but this time, because you couldn’t remember what you used before, you have created different words for the same objects or emotions. For example, swing is equivalent to swinging, smiles is equivalent to smiling while sings is equivalent to singing, and dresses is the plural of dress. You can easily see the problem and with time and many of pictures this small problem will become a giant problem. What do you do to avoid this problem? A vocabulary is made of words that have specific meaning. A controlled vocabulary is made of a list of words that limit the variations of similar words. If you have created such a list and use it to apply it to your images, then you are controlling your keywords and keeping your sanity. A controlled vocabulary will provide the opportunity for you to assign keywords that you have already used and avoid creating duplicate keywords. In the case when you need to add a new keyword, at least you know that you don’t have an existing keyword. This way you control your keywords. What software programs help you create a controlled vocabulary? Some software programs try helping you with this task by providing you a way to create categories of tags. This is probably the greatest help you can get from a software program when it comes to managing your image keywords. 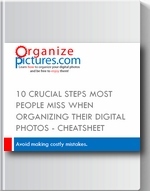 Most image management software programs do not address this problem at all. You would not expect this feature from small image viewers like FastStone Image Viewer or XnView, but you would expect it from a big name like Picasa. And yet, Picasa does not help in this area. The only thing you see in Picasa is the most common image tags you have used before, and it can only fit 10 or so image keywords on the screen. Adobe Lightroom and Zoner do provide a great way to organize your keywords. You can simply create keywords and place other keywords inside of those. This way you are essentially creating categories of keywords. A small and mostly unknown program, called PIE (Picture Information Extractor) helps as well. PIE gives the user the ability to have an external text file where you can simply list the keywords and then use that file when you assign IPTC keywords. The only problem with PIE is that the software will sort that file alphabetically and thus loose any structure you may have put in the file. But it is a step in the right direction. In my interview with Hans Fremuth from Metability Software (Read What is the future of image metadata? ), I have asked him for some suggestions for creating efficient image keywords. Try to stick to the same concept all the time, across all file types (same language, either singular or plural terms etc). Make sure to maintain a list of the words that you have used so far to avoid different words with the same meaning. Getty Images has a few tips as well for choosing good keywords for images. Their suggestions however, are focused on stock photographers. Stock photographers provide their pictures for sale and the pictures are very generic for somebody that needs to purchase them. A quick glance at these categories of keywords will show you that they are geared toward general photography used to illustrate concepts and ideas. But what about the home photographer that doesn’t try to sell their pictures? If you take pictures of your family and your vacations, what can you use? Always use singular for the keywords, even though there might be multiple objects in a picture. Instead of trees I would use tree. Always use lower case for all my keywords. Instead of Birthday I use birthday. Always use the infinitive form of the verb. Instead of cries, I use crying. Applies to the Emotions category mostly. Never use abbreviations. Instead of bday, I use birthday. I pretty much stick with the categories suggested by Hans with a few variations. location – park, home, backyard, california, solvang, palm springs, arizona, grand canyon – a long list. The simple answer is because it can’t be regulated. There is no standard way of applying keywords. There cannot be one controlled vocabulary that fits all purposes. Actually, there is one universal controlled vocabulary…it’s called the English language! And for that you already have the list created: it’s called the English Dictionary. The problem is that there are way too many words in this list! The conclusion is that you have to create your own controlled vocabulary that will work for you. Give it a try, start with a few words and add some more, but create some rules for yourself so that your vocabulary will actually be controlled. Getty Image Library suggestions for good image keywords. ControlledVocabulary.com – David Riecks’ website is the best place for getting more details about constructing advanced controlled vocabularies for photographers. How to use folders and tags the right way. This is my own article that shows the strengths and weaknesses of folders and tags. There are plenty of Keywording Tutorials on my http://www.photo-keywords.com/ website including an introduction to the tab-indented list format, error-catching, sorting techniques, explanations of hierarchy, and suggestions for making your own keyword lists. Also lots of free keyword lists, links to other commercial keyword lists, and my own keyword catalog. Thank you for the comment…and for indicating your website. Looks like it is full of very useful tutorials about image metadata.